This page is the Reading People Tracker's home page where you can download its source code for free. 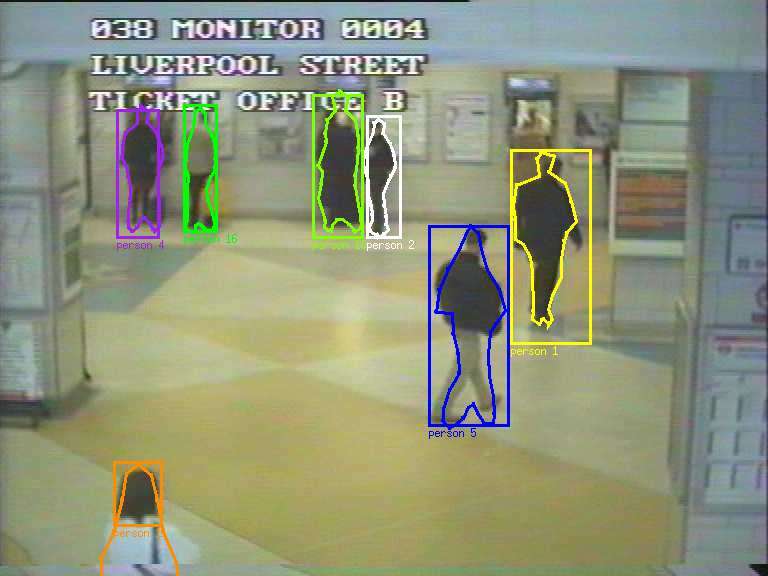 The Reading People Tracker is a software for tracking people in camera images for visual surveillance purposes. It originates from research work on people tracking for automatic visual surveillance systems for crime detection and prevention. It was built within the context of two PhD theses (by AM Baumberg and NT Siebel) and contains state-of-the art image processing algorithms. It is easily maintainable and well documented. Therefore it can (and has already been) easily be adapted to new requirements and different projects. The Reading People Tracker contains the necessary functionality to read video sequences from hard disk or a video camera (IEEE1394/DV), to manipulate the images with image filters and to analyse them with a number of detection and tracking modules. Now that the ADVISOR project has finished the Reading People Tracker is still being maintained and available for download below. Recent code changes include better support for newer compilers and a number of bugfixes. There has also been some support by the community in the form of bugfixes and a few small additions. This has increased stability and ease of use. The tracking functionality itself has not changed significantly since release 1.25 in 2003. However, an update to the newest version is strongly recommended for all current users. For information on the tracking algorithms that are part of the Reading People Tracker please have a look at this people tracking page. Many more details can be found in my PhD thesis and a few more details in the ECCV2002 article. A must read for users is also the User's Manual. All of these references are available from my publications page. The source code of the Reading People Tracker is available for download below. The terms of the license can be found in the file COPYRIGHT which is part of the software package. Installation/Compilation: See files README and the Makefile definitions in generic.mk. Configuration Options: See the help for the individual option in the GUI or its definition in the code. Functionality: The most comprehensive source is my PhD thesis. An overview is given in the ECCV2002 article and on my web page on people tracking. Do not forget to check the User's Manual in any case! It should also be noted that unless you are a programmer you might not find it very easy to install and navigate the tracker. Inventing or improving algorithms is done by programming in C++, so unless you can work with C++ you should carefully consider whether to start working with the Reading People Tracker. Current Release: 1.28 of Tue Nov 29 2005. Release 1.28 is a maintanance release and does not feature new tracking functionality. A few problems have been solved, e.g. when compiling with gcc version 4.x. One or two bugs have also been found and removed. A detailed change log can be found in the file CHANGES which is part of the software package. Example configuration, model and calibration files. Please note that these example files are provided for your convenience only and may not be re-distributed in any way. They were also designed for RPT version 1.25 and might require one or two changes (see CHANGES file or RPT's debug output). Netlib's Basic Linear Algebra Subprograms (BLAS) and Linear Algebra PACKage (LAPACK), or alternatively NAG's commercial Numerical Fortran Library (The Reading People Tracker works with NAG's "Mark 15" Fortran release without any changes). You will most probably need to adjust the file generic.mk to reflect the location of the libraries in your system. Some of the libraries are also readily available as RPM packages for GNU/Linux systems, see e.g. the RPM Find facility. In fact, most modern GNU/Linux distributions already ship with BLAS and LAPACK as optional system libraries. Please note that due to the limited time available to me I am unable to provide support for the People Tracker. Should you have a general support query (e.g, how to use the tracker in a particular art project) you are welcome to write me an e-mail, even though it might take some time until I actually answer. Should you, on the other hand, have problem installing libraries under Linux or getting the tracker to read images from hard disk, I would advise you to ask your friend or colleague with Linux administration, programming and/or image processing background to give you a hand. However, if you have worked with the tracker and you have implemented an extension or found a fix for a bug (I am sure there are some, albeit I do not know of any) please consider contributing your improvements to the community by sending me your changed code. Naturally, I will credit you for your work (see the file CHANGES for examples).